Vermeiden unbefugte Nutzung Ihres Produktes Fotos. Stamp Ihr Produkt Fotos mit Wasserzeichen, Text oder Bild Wasserzeichen. Text für Wasserzeichen, können Sie verschiedene Schriftart, Schriftgröße, fett, kursiv oder unterstrichen mit unterschiedlichen Farben. Bild für Wasserzeichen können Sie aus verschiedenen Formaten des Bildes, sind GIF, JPG, PNG und andere. Das Wasserzeichen können in verschiedenen Position der Foto. Sie können auch die Transparenz des Wasserzeichens und halten Sie die Lesbarkeit des Fotos. 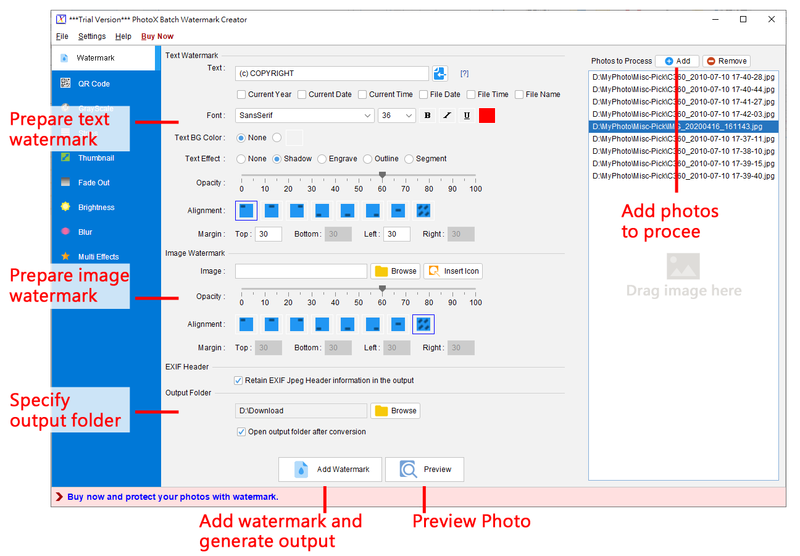 Evinco Solutions Ltd releases PhotoX software, version 1.9.0, batch watermark creator software that provides a quickest and easiest way to stamp your images with watermark. This distribution agreement constitutes a legal agreement ("License Agreement") between you (either as an individual or a single entity) and Evinco Solutions Limited ("Evinco") for the software product, PhotoX ("Software"), including any software, media, and accompanying on-line or printed documentation. You are hereby licensed to make as many copies of the Unregistered Version as you wish and distribute it to anyone provided that all files are intact. You must distribute the install form of the Unregistered Version (you must distribute the INSTALL file, not the files resulting of an installation). You are not allowed to sell the Unregistered Version (except for shipment and handling charges). Press is authorized to distribute it on any Cover Disk, CD-ROM without permission from Evinco. Shareware Catalog Web sites are authorized to distribute it as a download file (hosted or linked to Evinco site) without permission from Evinco. This Unregistered Version and its source code are proprietary products of Evinco and are protected by copyright and other intellectual property laws. The Unregistered Version is supplied "AS IS". Evinco disclaims all warranties, expressed or implied, including, without limitation, the warranties of merchantability and of fitness for any purpose. The user must assume the entire risk of using the Shareware. Evinco assumes no liability for damages, direct or consequential, which may result from the use of the Unregistered Version, even if Evinco has been advised of the possibility of such damages. This license statement and limited warranty constitutes a legal agreement ("License Agreement") between you (either as an individual or a single entity) and Evinco Solutions Limited ("Evinco") for the software product, PhotoX ("Software"), including any software, media, and accompanying on-line or printed documentation.